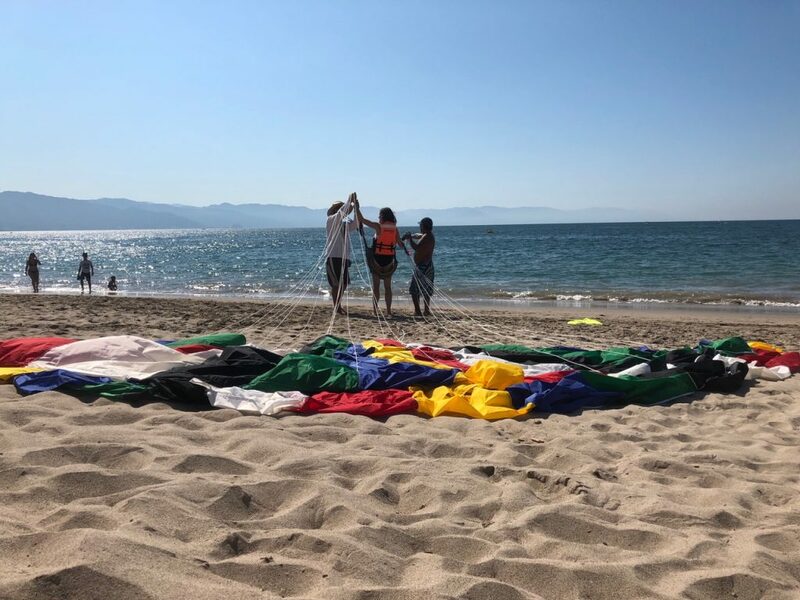 How I abandoned my comfort zone during my first parasailing in Puerto Vallarta. I smiled, clicked the “like” button and moved on to the next few comments. I love my circle of travel blogger friends, always ready with advice on any travel destination, not to mention Jon and I seem to have similar taste in many things. Not this one though: parasailing is not-my-thing. For me, it falls in the same category as rollercoasters, which are also not-my-thing. Not because I’m scared of them, but because I simply don’t find joy in feeling that I’m about to vomit. Or am I… scared? I told myself I’d rather spend my money on a cooking class, so I can make killer chile rellenos back at home for years to come than be uncomfortable dangling from a parachute for ten minutes, just to be able to say that I did it. And then something, not sure what, made me pause and go back to Jon’s message. Wait! OMG, parasailing. Being way out of my comfort zone, dangling from a chute in the sky was EXACTLY what I needed. Being way out of my comfort zone, dangling from a parachute in the sky was EXACTLY what I needed. 2017 was not a great year for me. In fact, this is probably an understatement. For the record, I’m a big believer in creating our own happiness. Sure, stuff happens, but – as I always tell my kids – it’s how we deal with it, right? But 2017 tested my glass-half-full attitude many times. There were difficulties and drama on the home front, with my parents, kids, a few friendships, with my job, my husband’s job, our house, both of our cars and even our health. The Universe did not take pity on me. For every break through, there seem to have been several set-backs. Just when I thought I was coming up for air, I got dunked in the water again. I blame it on the Year of the Rooster, but that is a separate story. There were several things I wanted to accomplish in 2017, but I did not. For the goal–oriented me this was hard. For the overachiever in me, even harder. All were objectives and deadlines established by myself, not imposed by anybody else, but this was probably the worst part: I felt I was letting myself down. Those who know me think of me as full of life and a go-getter, but here I was, feeling unmotivated, robbed of energy, down more times I care to admit. Where the heck was my groove and how do I get it back? 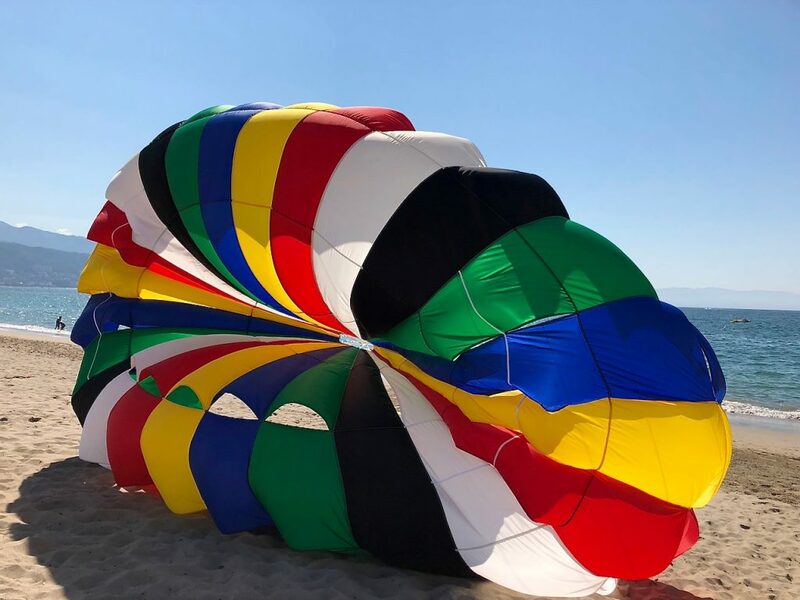 Maybe it helped that we were just about to say goodbye to 2017 and that I was very ready to turn a new leaf, hoping to shed any bad kharma, but all of a sudden, and thanks to Jon, I knew I had to go parasailing, no matter what. The mere thought of it freaked me out and I got butterflies in my stomach envisioning myself in the sky, looking down, waaay down. Did I mention that I am mildly, OK possibly moderately, afraid of the heights? 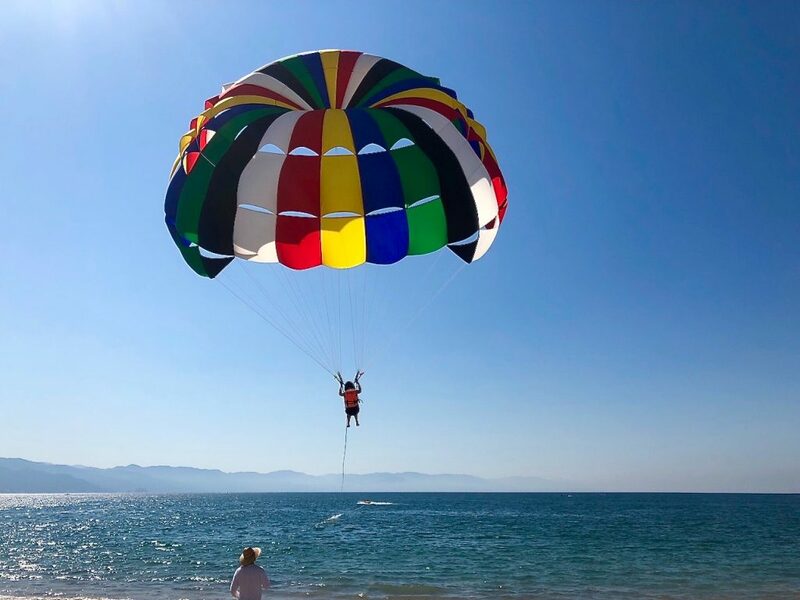 Was it just me or did that chute seem to be waaay higher here in Puerto Vallarta than any parasailing I have ever witnessed from the ground before? Is that what Jon meant by “best place in Mexico to try parasailing”? But all that fear and nervousness only made me more determined. This is one of the best parts of determination: being focused, feeling present and alive. 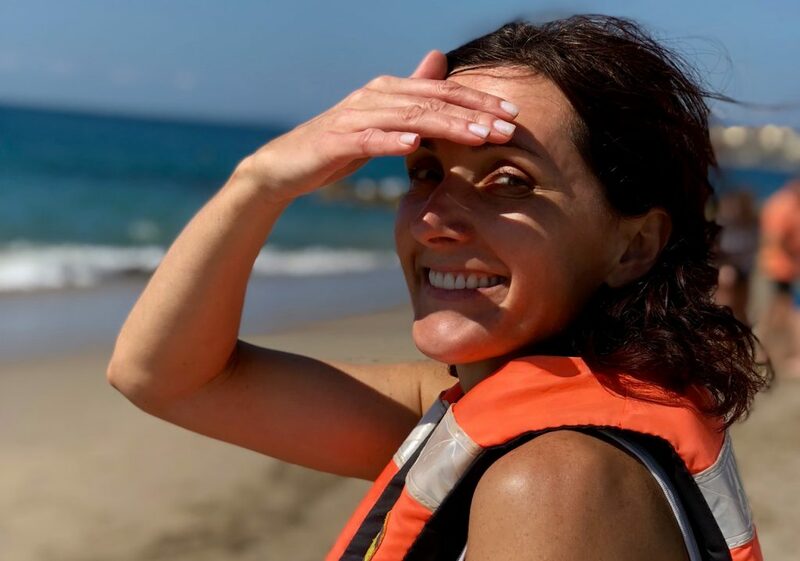 So here I was, on the beach in Puerto Vallarta, ready to go parasailing for the first time. With the harness and a life jacket tightly strapped on me, I was waiting for the previous rider to land, so that it would be my turn. I remember feeling so alive at that very moment, all my senses working. I remember the hot sand burning the soles of my feet. I remember the sight of the glistening ocean in front of me and the sound of the waves crashing on the beach, just a few steps from where I was standing. I could hear the chatter of my family and Canadian friends we met at the Hilton where we were all staying, standing some steps behind me, discussing who else might want to try “the ride” and the best angle to take pictures of me. There were a few tourists, who stopped as they saw me in my harness, then looked up in the sky as if to check what I was about to get myself into. It was high noon and the beach was alive with action, yet I was somehow comfortably alone, in my bubble. This is one of the best parts of determination: being focused, feeling present and alive. I looked at Lico, the instantly likable Mexican, who ran the parasailing concession on the beach. He winked at me and gave me a thumbs up. When I met him three days prior, we bonded immediately. I asked about the price and told him I was “thinking about it and that I had some time since we were in town for a few more days”. He knew this meant I needed a few days to assess how safe this whole things was (by observing twenty other tourists do it) and gather my courage. I could tell he also immediately understood that while I was terrified, I needed to do this. I was grateful for that. I found the right guy. Unlike numerous vendors on the beach, he gave me zero pressure. He totally knew the only pressure I needed was from myself. It all went very fast from the moment the tourist before me landed. Lico asked me if I was ready and after I nodded, he checked my gear one more time, then hooked me onto the rope. I made sure I squatted down exactly the way he showed me remembering his words, “This is the #1 mistake people make”. Well not me, not in 2018! I heard the whistle, a crew on the beach giving a sign to the boat, waiting to pull me out and the next thing I knew, my feet were off the ground and I was going high, and then much higher, very quickly. Lico and his side kick, preparing me for my first parasailing adventure. Life jacket? Check. Harness? Check. Excited? Check. Nervous? Check. If you were expecting me to tell you how fantastic and free I felt, I’m here to disappoint you. I was scared, there was a knot in my stomach and I was gripping the straps so hard, my hands hurt. I remember thinking how insanely high I was and then, just as I finally started to relax, I freaked out again when the boat began to turn to go back to our beach and the wind gusts whipped the chute in a few different directions. At some point I remembered Lico telling me to relax up there, let go off the straps and spread out my arms to feel like I’m really flying. Must be the same nirvana caught by the people on the coasters with their arms raised high over their heads? I thought about it for a second, but decided this wasn’t the time, so I just kept on gripping. Off to enjoy my first parasailing adventure under the watchful eyes of Lico. There were parts that were great, of course, or I would not be writing this story. The view was unbelievable. It was a sunny blue-sky day and the glistening ocean below me, the lush mountains of Sierra Madre encircling the bay of Puerto Vallarta and the old town Vallarta in the distance, were just beautiful. I loved the silence around me except for the whistling of the wind. At the risk of sounding cheesy, I remember feeling grateful for being alive, for having the opportunity to do this, for all the incredible people in my life, for the amazing experiences, both tough and fantastic, my life had brought me so far. Even all the crap of 2017. Most importantly, high up there in the sky, I found peace with not delivering on all of my promises in the past year and determination to go after them and… new ones in the coming one. 2017 may have been tough, but I am tougher. Way tougher. The New Year means nothing if you are still in love with your comfort zone. 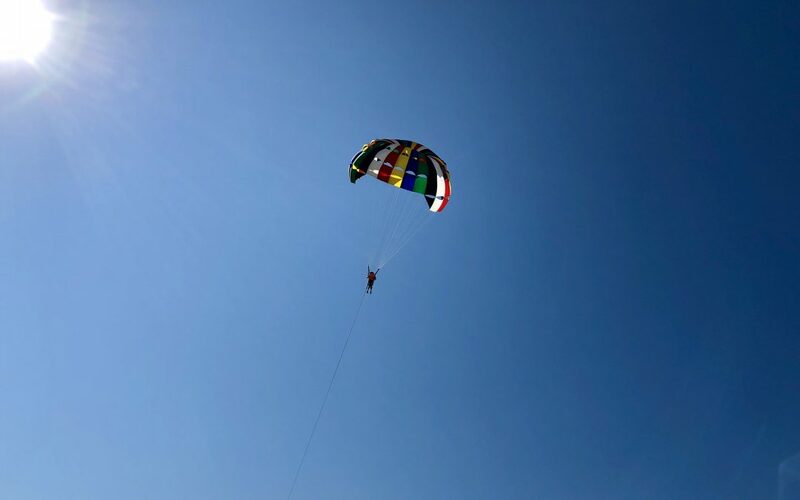 If you are one of those people who have gone parasailing a hundred times before, you might not appreciate this story, but for me, the girl who, as it turned out, was afraid of the heights after all, it was a big deal. I conquered my fear of flying. Literally and figuratively. The New Year means nothing if you are still in love with your comfort zone. Sometimes things that scare us the most, turn out to be the best things for us, exactly what we need at the time. PS: You can probably guess that I landed exactly on the cross Lico made for me after carefully following his directions during my descent. Spot on. It was a victory for both of us. We laughed and hugged and I told him next time I go parasailing in Puerto Vallarta, my arms will be spread out like the wings of an eagle.